And anonymously appear to be anywhere you choose with GOOSE VPN service! 64+ Servers & IP's addresses to choose from. 836 TB of data secured to date. Clawback your online security today! 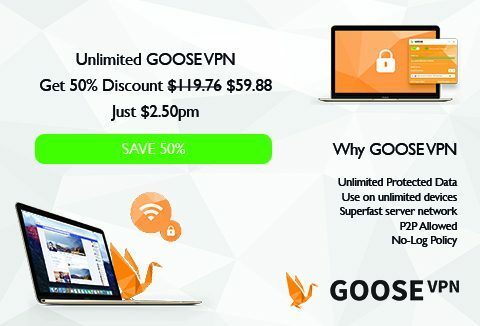 5 reasons to get GOOSE VPN! A high strength 256-bit encryption to protect your data. Log-free internet access whilst not restricting your internet speeds. Changes your IP address, Choose among any of the server locations from around the world. Setup in just 3 steps, within 3 minutes. You will receive a coupon link after purchase to redeem the plan after successful purchase. DealClub members grab it for $49.99!